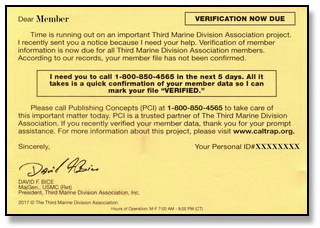 The Third Marine Division Association has contracted with Publishing Concepts Inc. (PCI) to produce a comprehensive, hard bound Membership Directory. PCI will be mailing cards to members to confirm member information. If you have any questions, please contact Association Manager Corey Fisher at 215-822-9094 or gygee@aol.com.